Luxury homes stand out and yet blend in with the habitat along the way. It is also home to Javelinas that escaped our view on this round but a bobcat scampered across the 17th fairway perhaps in pursuit of a bunny fleeing to the mountain where nature conceals them all. If you don’t see any bobcats, you will likely see Cat on the golf cart serving hydration, libations and smiles. Water dispensers are also frequently positioned at tee boxes. Consider a stop at the outdoor grill before teeing off or at the turn. Lori was our expert grill mistress there while Tori efficiently handled the bar inside at The Grille. Make time to stop there and enjoy the stunning landscape from the patio or window seats. Hole #9, par 4, 446 yards – Close out the front nine with a severe dog leg left uphill. Optimally use the slope of the hill to again feed the ball to the center of the fairway. The green is two tiered with a ridge unseen from the distance. You could cheat a little bit by observing the pin location from the tee box of number one. The green is heavily bunkered and beware of the rise in elevation. It could mean a one or two club difference. The climb can be strenuous, but the outdoor grill is nearby to recharge the batteries with a hotdog, brat or possibly hot sausage with all the condiments, and chips. 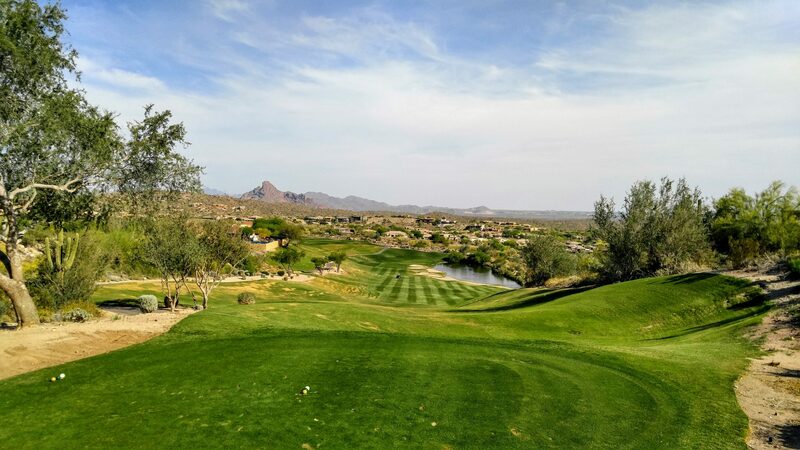 Hole #14, par 4, 384 yards – This dog leg right has a mighty saguaro at the turn filled with golf ball indentations. Your aiming point is left of fairway. It is best to catch the slope of the hill for a closer shot to the deep ravine separating the fairway from the green for a pop up and in to make birdie. The wash is wide and the green is elevated. Long is better than short as any shot into the ravine has double bogey written all over it. Professionally managed by OB Sports, Eagle Mountain has a nicely arranged pro shop with more than a golfer would ever need. Outside carts are waiting or you can surf the mountain on a Golf Board for $25 a round if you dare. Check out the website for lower summer rates, academy info and gift cards.